Despite the clear scoreline, it was anything but straightforward for Floriana. A goal down after 18 minutes and beset by the absence of a host of first-team players, Floriana laboured to impose themselves on their relegation-troubled opponents. The Lions had been worth their lead but Floriana gave the Lions a lesson in patient, counter-attacking football. Igor Coronado’s powerful runs were behind his team’s better showing as the Brazilian rediscovered his sparkle to score a hat-trick and secure victory for the Greens. Faced with the suspension-related absence of goalkeeper Matthew Calleja Cremona, Vito Plut, Steve Pisani and Amadou Samb, coach Giovanni Tedesco restored Valerio Senatore between the goalposts and Coronado to the Greens’ starting formation. Tedesco was also boosted with the return of Matteo Piciollo and Conor Borg. Coronado took over from Plut up front with Giovanni Galea and Piciollo probing for openings on the flanks. Naxxar made only one change from the draw against Pietà with the returning Julian Azzopardi taking his place in goal at the expense of Luke Pecorella. The Lions hit the ground running, starting at a frenetic pace but it was Floriana who threatened first inside the first ten minutes. They were awarded a free-kick on the right flank which was taken by Felipe Douglas. His delivery was met by Galea whose dipping header fell into the safe hands of the well-positioned Azzopardi. Emerson Marcelina conceded possession in the 18th minute as Gilmar moved forward and found Jorge on the right flank who squared for Daren Falzon to stab home leaving keeper Senatore helpless. Past the half-hour mark, Frank Temile was presented with Naxxar’s best opportunity to double their lead but the Nigerian striker blasted over the bar from Gilmar’s inviting cross. Naxxar paid the price for their profligacy in front of goal and their own defensive naivety as Floriana equalised on 37 minutes. Marcelina was allowed to race clear as he set up the unmarked Coronado, who steadied himself before thumping a finish high past Azzopardi. 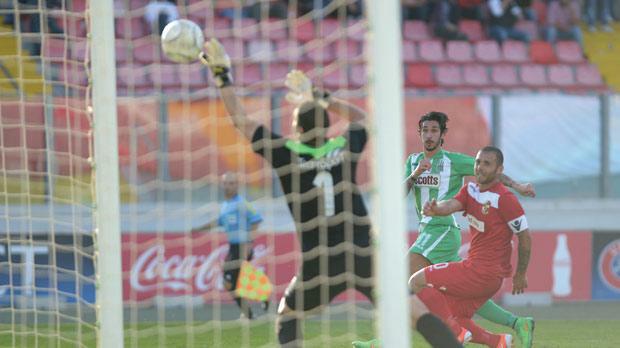 Floriana then succeeded in taking the lead just before half-time. Pouncing on a miscued pass, Coronado accelerated into the Naxxar box before ramming his shot past the goalkeeper. The Greens extended their momentum into the second half, thanks mainly to better movement from their forwards and improved support from the flanks. Coronado sped past Angus Buhagiar before unleashing a low drive, Azzopardi dived late as the ball rolled under his body – 3-1. Floriana seized control and four minutes later they put the result beyond Naxxar. Manolito Micallef swung in a cross and Piciollo nipped at the far post to volley home. Looking for a way back into the match, Lions coach Jesmond Zerafa introduced Terence Vella for David Fenech. There was no immediate change to the pattern of the game even though, bolstered by the introduction of Vella, the Lions started to believe more in themselves. On 71 minutes, Vella dragged a dangerous cross into the Floriana box for Jorge but Micallef, who was outstanding for the Greens, managed to clear off the line. Four minutes from time, Piciollo threatened to punish the Lions’ flat-out approach coming face-to face with the goalkeeper who was quick enough to block the Floriana striker and avoid further embarrassment to his team. V. Senatore-6.5, F. Douglas-6, E. Marcelina-6.5, I. Coronado-7.5 (69 G. Muir-5), M. Piciollo-6, C. Borg-6, E. Briffa-6 (77 D. Agius), G. Galea-5.5, S. Borg-5, S. Bonnici-5, M. Micallef-7 (86 G. Tabone). J. Azzopardi-5, A. Scicluna-5, I. Edet-6, F. Temile-4.5, D. Falzon-6, Gilmar-6 (62 P. Doffo-5), R. Cassar-5, D. Fenech-5 (60 T. Vella-6), A. Buhagiar-6, Jorge-6.5, A. Bruce-5. Yellow cards: Gilmar, Micallef, Bruce, Falzon. BOV player of the match: Igor Coronado (Floriana).